Mexico was the cradle of a number of important civilizations that developed throughout the region. There are over 180 archaeological sites in Mexico that are open to the public. For the archaeology enthusiast, all are worth visiting, but there are a few that stand out from the rest in their size and magnificence. These are the largest, most impressive sites in the country, ones that we think everyone should visit. All but one of these ancient cities reached its peak during the Classic period of Mesoamerica, between 200 and 900 A.D. The exception is Chichen Itzá, which, though populated during the Classic period, rose to prominence later. The Pre-Hispanic city of Teotihuacán was one of the largest urban centers of the ancient world. It had a population of over 100,000 in its heyday. Located in a valley rich in natural resources, Teotihuacan was the seat of power of one of the most influential Mesoamerican societies in the political, economic, commercial, cultural and religious spheres. Teotihuacan has two very large pyramids which visitors may climb: the Pyramid of the Sun and the Pyramid of the Moon. Both offer stunning views of the site from above. A large avenue known as the Avenue of the Dead intersects the ancient city. The city was abandoned before the time of the Aztecs, but they recognized the site's importance, and gave it its name, which is interpreted as meaning either "City of the Gods" or "Place Where Men Become Gods". Teotihuacan can be visited on a day trip from Mexico City. Chichen Itza was the political and economic center of Mayan civilization between 750 and 1200 A.D. Its impressive structures demonstrate the Mayas' extraordinary use of architectural space, as well as their vast astronomical knowledge. Chichen Itza can be visited on a day trip from either Cancun or Merida, but to take your time at the site, spend the night in one of the on-site hotels, or in the nearby town of Pisté, and rise early to get the chance to explore the site before the tour buses from Cancun arrive. You'll enjoy the site in a much more peaceful way without the crowds. The ancient city of Monte Alban was built in a strategic location on the top of a mountain in the center of the valley of Oaxaca. 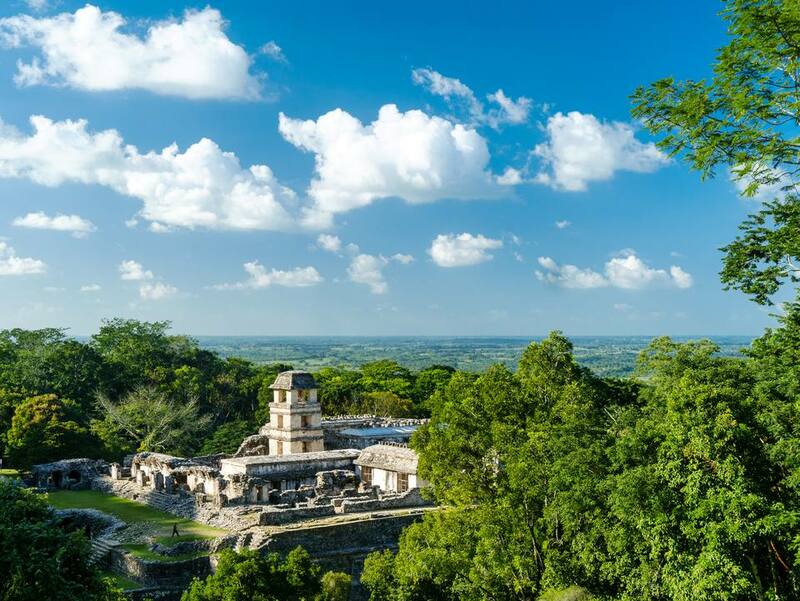 This is one of the oldest cities in Mesoamerica and was founded by the Zapotecs, who settled here around 500 BC. In order to build the city's main square, the Zapotecs leveled the top of the mountain, creating a giant platform that is about 300 meters long and 200 meters wide. From their mountain-top location, they maintained control over the central valleys for a period of nearly thirteen centuries. Monte Alban is located just outside of the city of Oaxaca. Located in the lush green jungle of Chiapas, this site is characterized by its elegant and well-crafted architecture and beautiful sculptural art. Two important burials of rulers were found here, the tombs of Pakal the Great, and the Red Queen (Reina Roja), so called because her remains were covered in red cinnabar powder. When it was at its peak during the late Classic period (roughly 600 to 900 A.D.), its influence extended over a large part of the Maya area, what is today the states of Chiapas and Tabasco. The archaeological site is located about four and a half miles from the modern town of Palenque or 135 miles from San Cristobal de las Casas. El Tajin was the capital of Totonac culture and was the most important power in north-east Mesoamerica after the fall of Teotihuacan. Its architecture is characterized by elaborately carved reliefs on columns and friezes. One of the most interesting buildings in El Tajin is known as the Pyramid of the Niches, which contains a total of 365 Niches and is thought to be a representation of the solar calendar. El Tajin is the Mesoamerican city with the greatest number of ball courts: there are a total of 17. El Tajin is located in the state of Veracruz and can easily be visited on a day trip from the city of Papantla.